The Solar Time Clock is the creation of British clockmaker George de Fossard FBHI, who has spent more than three years building the elaborate timepiece which comprises of over 750 hand made parts. 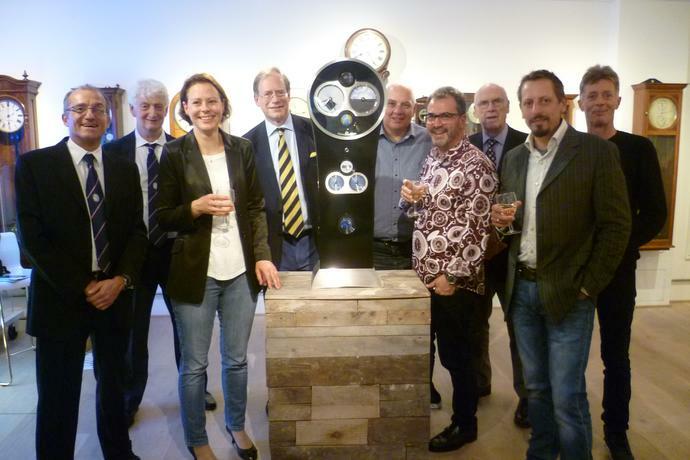 So notable is the clock that negotiations are taking place for it to be displayed in the Worshipful Company of Clockmakers’ Museum, within the Science Museum, London – there it will join clocks and watches made by horological giants such as Tompion, Harrison and Daniels. “I came to West Dean in 2003 to study the conservation and restoration of antique clocks. My dad was a clockmaker and when I was growing up, I used to spend hours tinkering in his workshop and making things on his lathe. I probably used to drive him nuts. I left school at 16 knowing that I wanted to work with my hands, so I served a five year mechanical engineering apprenticeship, gaining invaluable experience in machining, bench fitting and workshop practice. After my apprenticeship, I studied engineering at university and worked in industry for a short while before deciding that I needed to get back to the bench and start getting my hands dirty again. I studied for two years at West Dean and in my second year, I spent my evenings and weekends designing and building my first clock. It was a busy year, but it made me realise that clock making, rather than restoration, was what I really wanted to do with my career. Becoming an independent clockmaker doesn’t happen overnight though, and when I left West Dean, I set up a restoration workshop in Bath. A loan from The Prince’s Trust was invaluable in helping to pay for the tools and equipment required, and the timely retirement of my father helped enormously with the establishment of a customer base! A combination of luck and perseverance over the following years secured me a number of commissions for new clock movements, which I worked on part time alongside my restoration work. Not only did the restoration side of my business provide me with a steady income, but it also meant that I was gaining essential experience in the art and craft of clockmaking and learning from many of the great past masters of the trade.